Store will Open - June 2019! The 38th Annual 2019 Keystone State Games Festival of Sports are taking place throughout Luzerne County during the weeks of July 25-29 & August 1-4, 2019. Since its inception in 1981 Keystone State Games, Inc. has attracted over 500,000 participants of various age groups into their events. CLICK HERE for the GENERAL SPORT APPLICATION for Mail-In applications and Walk-Ons - If mailing an application please send to Keystone State Games, Inc., PO Box 1166, Wilkes-Barre, PA 18703-1166 - mail-in application must be received 7 business days before the listed sport deadline. Lots of fun in Northeast PA beyond just the Games! We invite and encourage all participants and their families to visit Montage Water Park during your stay at the Games. For admission discount please click on the following link - Information coming summer 2019! Includes admission to the 2019 Keystone Games Athlete Reception and Picnic (food discounts but not included in discount ticket price) with access to the Waterpark at Montage Mountain for participating athletes and affiliated parties on date to be determined. Not valid any other day. Click the following link for tickets - Information coming summer 2019! At the conclusion of the 2019 Keystone Games Athlete Reception and Picnic at Montage Water Park there will be the opportunity for you and your family to enjoy America’s Pastime by going just down the road to the Railriders (Triple-A Affiliate of the New York Yankees). Fireworks to follow at the conclusion of the game. It is very important that our athletes that require lodging for the 2019 Summer Games please consider staying at our sponsors/participating hotels to ensure the hotels that are willing to support the games are valued for their dedication to the Keystone State Games and all of our participants! For the guests to receive the rates listed in the above link, most hotels are asking that they refer to the code Keystone State Games 2019 but several have other codes or have included online links (see Downloaded Hotel List above for more Information). Keystone State Games Medical Services will be provided by Geisinger at designated areas throughout the 2019 Keystone Games Festival of Sports Competitions. The mission of the Keystone State Games is to promote physical fitness, sports activity, and sportsmanship as a health improvement and disease prevention strategy for all Pennsylvanians and other participants and to create an expanded, coordinated and citizen-sponsored program of amateur athletic competition. Provide a comprehensive, coordinated and citizens supported program of sports and fitness competitions to promote physical fitness in which all Pennsylvanians can participate for the purposes of personal growth and development, and the enhancement of physical and mental health. Provide a mechanism and medium through which Pennsylvania’s sport bodies can stimulate physical fitness and sports involvement for everyone. Encourage government, schools, businesses, industry, foundations, and individuals to support expansion of physical fitness and sports participation as a disease prevention strategy in an effort for personal wellness. Provide a statewide, multi-sport program with an Olympic format, to encourage and assist in preparing Pennsylvania’s athletes to enter national and international competitions. The Keystone State Games are a result of a resolution by Representative Joseph R. Pitts (Chester County) and approved by the Pennsylvania General Assembly in 1980. Keystone State Games Inc., a nonprofit corporation, was formed in 1983 with the help of former Governor Richard Thornburgh so the Games would not be solely dependent on government funding. 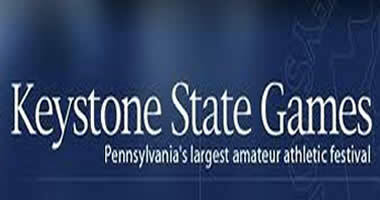 Since its inception, Keystone State Games, Inc. has attracted over 500,000 participants of various age groups into their events. We encourage All of our athletes to be mindful of the weather. The forecast is hot and humid and that could cause scattered thunderstorms with lightning. If weather causes a delay, coaches will be notified and updated schedules will be found on this site: KSG LIVE. Lightning is the most dangerous and frequently encountered thunderstorm hazard that people experience every year. To ensure the safety of our participants and their families, we will follow the National Athletic Trainers’ Association: Lightning Safety for Athletics and Recreation. Please Click Here to view the Policy. Medical Staff will have the ONLY decisions on lightning delays and continuations. View results of the 2018 Keystone State Games Festival of Sports and the Pennsylvania Senior Games by clicking on KSG Live. Click Here for a Direct Link to the KSG LIVE Page.